I thought this was a good general history although I think the coverage of the development of the Holy Roman Empire is a bit confusing--both Charlemagne and Otto are referred to as the founder. I may have more to say as I type up my notes but I do think this is a good starting place for someone new to the subject. 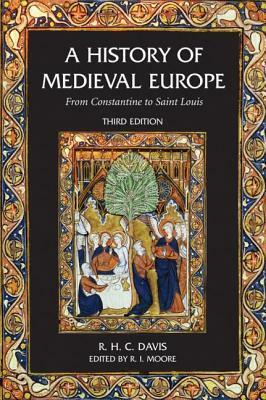 Was a great introduction to the middle ages but can be a bit difficult to dip into as a beginner but I did enjoy it. I found this a book of two parts; I really enjoyed the sections on the papacy but found the sections on economic matters and descriptions of the differing ways on dividing feudal property a little dry. It was good that additional comments and material on more recent developments in scholarship were included. Overall, a solid 3 star rating (would have been 3.5 if they allowed halves on the site). As an introduction to the period, this book cannot be beaten - even now so many years since it was written. New findings and ideas bookend the chapters. They bring you up to date, provide fascinating context, and leave the chapters surprisingly unscathed. My only regret is that my memory won't retain all this information for long! Although it is decades old, needs updating and seems to be fairly narrow in surveying predominantly the medieval historical development of the Papacy, France and the Empire, there are still few better places to find a balanced, enjoyable and thorough treatment of the subject. I just read the Viking related parts from this book for my historical enquiry. The book is good, yet has many outdated theories as it from 1957, yet shows a good alternative view compared with many modern scholars. I've had this book since purchasing it for a university class in 1981. I've still got it and still drag it out occasionally to re-read sections. Not for someone looking for an easy weekend read.